It’s probably already been several months since you heard about WHMIS 2015 and the changes to put in place. But did you know that as of December 1, 2018, you are obliged to comply with these new requirements? This article discusses the history of WHMIS 2015 and what you are required to set up as an employer. 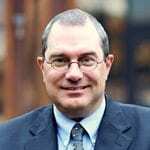 Where does WHMIS 2015 come from? On February 11, 2015, the Government of Canada published the Hazardous Products Regulations (HPR) under Part II of the Canada Gazette. This regulation and the subsequent modification of the Hazardous Products Act (HPA) have led to changes in the 1988 Workplace Hazardous Material Information System (WHMIS), by incorporating the Globally Harmonized System of Classification and Labelling of Chemicals (GHS) used in Canada. The new version of the WHMIS is called “WHMIS 2015”. The transition to the WHMIS 2015 involved a transformation period divided into three stages, synchronized nationally across federal, provincial and territorial jurisdictions. The deadline set for employers by federal, provincial and territorial agencies responsible for occupational safety and health in the workplace is December 1, 2018.
as well as awareness programs and training programs. “GHS” refers to Globally Harmonized System of Classification and Labelling of Chemicals managed by the United Nations. The GHS covers all hazardous products and their mixtures and it is to this international system that WHMIS 2015 is harmonizing. Canada already has laws in place for consumer products, pest control products, cosmetics, instruments, food and drugs, explosives and hazardous residues. These products can thus meet their current labelling and training sheet requirements. The communication of information on hazardous products is standardized by the use of safety data sheets (SDS) and standardized labels. The global classification criteria for hazardous products. The GHS has a modular approach that enables hazard identification systems to have a common harmonized base. The competent authorities of various countries are free to determine which modules are applicable to different parts of their system. What are the impacts for the provinces? Provincial legislation has been amended to adjust to the provisions of the Federal Government. Each province had legislation that coexisted during the transitional period ending December 1, 2018 for most provinces, except for Alberta where the period ended June 1, 2018. WHMIS 2015 imposes certain parameters that will have to be implemented as of December 1, 2018. Otherwise, the employer is liable to a fine. Manage inventory products and obtain forms and labels from suppliers, or failing this, prepare them himself. Prepare safety data sheets with 16 sections for hazardous products manufactured by him. Supply the labeled products and RIHP compliant safety data sheets as required. Signal word: It is one word, either“Danger” or “Warning”, indicating the presence of a potential hazard and its severity. The word “Danger” is used for most serious hazards, for example, corrosive effects on the skin. The word “Warning” is used for less serious hazards such as skin irritation. Hazard statement: It is a sentence assigned to each category or subcategory of the class of danger describing the nature of the hazard presented by a hazardous product. Pictogram: Hazard pictograms recommended by the HPR, with some exceptions, consist of a danger symbol in black against a white background with a red border in the shape of a square set on one its points. 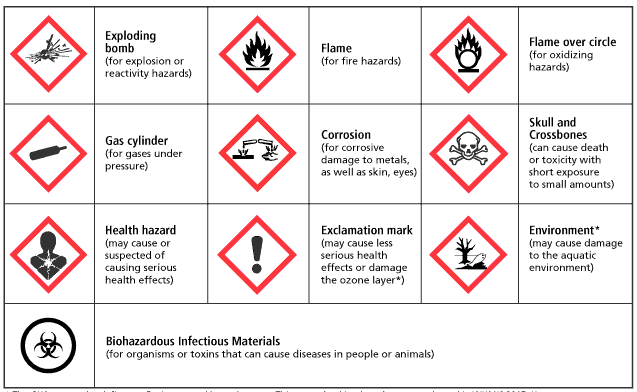 The pictograms used by WHMIS 2015 are also harmonized with the GHS, which gives them international recognition. They are used to quickly notify the user of the type of hazard present on the product. In addition to appearing on the product label, the pictogram will also be present in the safety data sheet (SDS). 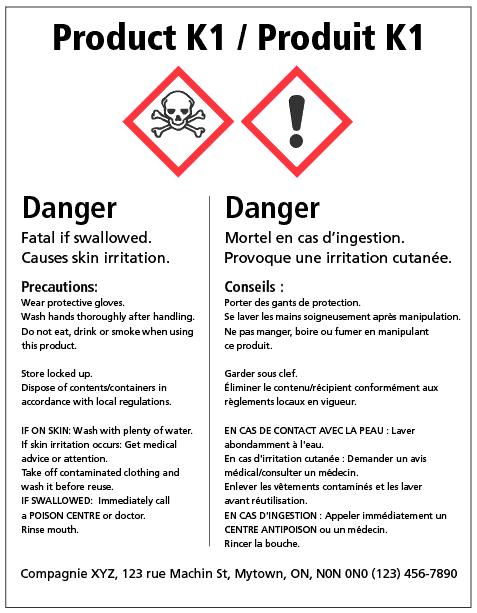 Here are some examples of WHMIS 2015 pictograms from the Canadian Centre for Occupational Health and Safety. Precautionary statements: Statements describing the recommended measures to minimize or prevent adverse effects resulting from exposure to hazardous materials during storage, handling or use. Product identifier: It is the brand name, chemical name, common name, trade name or generic name of the hazardous material. It should be identical to the one indicated on the material safety data sheet. When a product has the WHMIS 2015 label, it should be accompanied by a WHMIS 2015 safety data sheet. The WHMIS 1988 material safety data sheet is no longer permissible in this case. In Canada, the information contained on the label should be in both the official languages. It could be a bilingual label or two separate labels, one in French and the other in English. The GHS does not include the classification and labelling of infectious substances. However, in order to safeguard workers in Canada, such substances are considered to be hazardous by the HPR. Following the harmonization of the WHMIS with the globally harmonized system of classification and labelling of chemicals (GHS), material safety data sheets (MSDS) comprising nine information categories have been replaced by another document called the safety data sheet (SDS) with 16 sections. This sheet shall be globally harmonized since it will be in force in all the countries that adopt the GHS. Since the SDS is standardized, it will be easier to use it, as the information will always be available on the same section on the form. The occupational health and safety law, the Regulation respecting information on controlled products (in force until December 1, 2018) and the Regulation respecting information on hazardous products (RIHP) (in force since June 3, 2015) are very precise with regard to training. The training and information program is addressed to people exposed to or susceptible to hazardous materials. The employer should ensure that the training and information program is customized for workers and is suitable for the specific conditions of the workplace and to the nature of the hazardous materials present there. Each province has their rules related to the training processes. For sure, the employer should ensure that the training and information program is customized for workers and is suitable for the specific conditions of the workplace and to the nature of the hazardous materials on place. Should the employer train and inform workers about the WHMIS 2015 even though they have already attended information sessions on the WHMIS 1988? Yes, since important changes have been made with regard to the regulatory information of labels, safety data sheets, training and information program. Moreover, workers should always be trained and informed on risks of exposure or about measures to be taken in case of emergency, whenever a new hazardous material is introduced in the workplace, when the employer comes to know of new and important data, or when changes take place that impact working methods. Workers should also be trained and informed on the WHMIS 1988 if the labelling of products used in the workplace is compliant with that system. Have modifications to the workers training and information program been made in the new regulation? The program should envisage the means which the employer must implement in order to ensure better comprehension and proficiency with regard to the knowledge acquired by the worker, as well as his capacity to correctly apply safety rules for protecting his health and physical integrity. Training with regard to where the safety data sheets are stored, the means to access them, the technology related to the format in which they are stored, and the means to transfer them to a paper format. You are compliant? You can now optimize your system! Whether you want to be compliant or keep your system up-to-date, using software helps you optimize every step of the way. and manage the training required for your workers. Visit this page to learn more about CONFORMiT software.